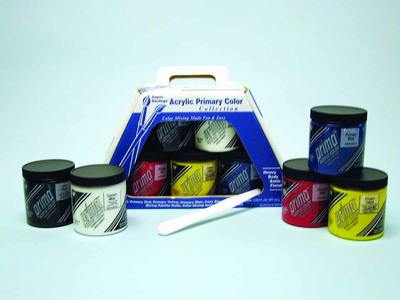 PRIMA ACRYL PRIMARY COLOR SET (5 JAR 236ML) & MORE. What every artist should know; The basics of acrylic primary color mixing. Set contains: five 236ml jars of Prima® Acrylics - Primary Red, Yellow and Blue, with Ivory Black and Titanium White. A mixing palette knife and a color wheel to aid in mixing your favorite colors are included. Made in the USA.